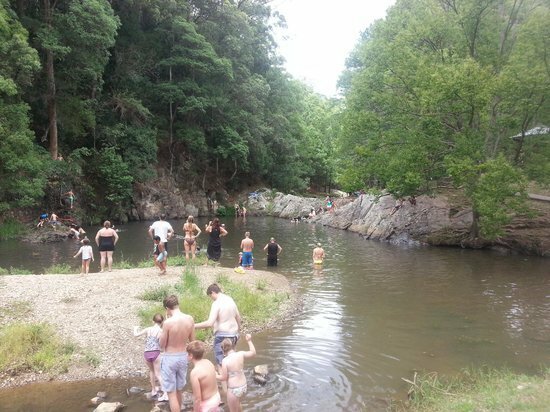 We have prepared a list of natural swimming holes in or around Brisbane for you. Enjoy Swimming ! Sweltering heat, unbearable humidity and blinding rays: these are the challenges faced on an almost daily basis when Brisbane’s sunny, upbeat weather becomes a bit too much – especially for those who have not been in Queensland all that long. When it is not hot, it is rainy, sticky and just all-around unpleasant for weeks on end. However, we Queenslanders have found ingenious ways to beat the heat without monstrous electricity bills or red, chlorinated eyes as drawbacks. With a bit of exploration of Brisbane and Aussie know-how, serene rainforest swimming holes and majestic rock pools are just waiting for you to take a refreshing dip. Popular among locals, The Currumbin Rock Pools are a treasure among swimming holes, being only a 15-minute drive from Currumbin Beach and just over an hour away from the Brisbane CBD. The drive itself is worth the trip, as visitors get to travel through the lush Currumbin Valley before reaching the secluded area for their well-deserved swim. The pool depths vary, but there are plenty of places for people of all ages to enjoy a casual dip, including shallow pools for young children. Coffee, cold drinks, snacks, ice-cream and other goodies can also be found across the road at the Currumbin Community Farm Campus, which is a lifesaver if you forgot your lunch. With a variety of spots for picnics and available public toilets, the Currumbin Rock Pools is an ideal location for a family venture. As an idyllic place to canoe, swim, picnic, barbeque and relax, Bunya Swimming Hole has something for everyone seeking to escape the heat. Located just north of the Brisbane CBD at the end of Dugandan Road in Bunya, Bunya Crossing Reserve has a number of amenities from gas barbeques, picnic tables, wheelchair accessible toilets, recreational walk trails, a waterhole for swimming and non-motorised water sports, an off-street car park and water taps for a complete day out. The reserve gates are closed at sunset and opened at sunrise each day and the area itself is surrounded by thick, verdant bushland, so be sure to plan ahead. As a favourite among Brisbane families, Cedar Creek Rock Pools at Samford offers families the chance to cool off and avoid the crowded beaches and public pools while being able to experience the natural beauty of Queensland bushland. 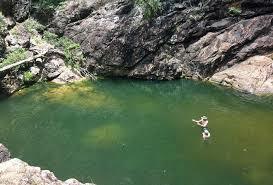 Located northwest of Brisbane and being less than an hour away from the Brisbane CBD, Cedar Creek Rock Pools is an easy side trip for a cool off with multiple pools which are perfect for toddlers and young children. 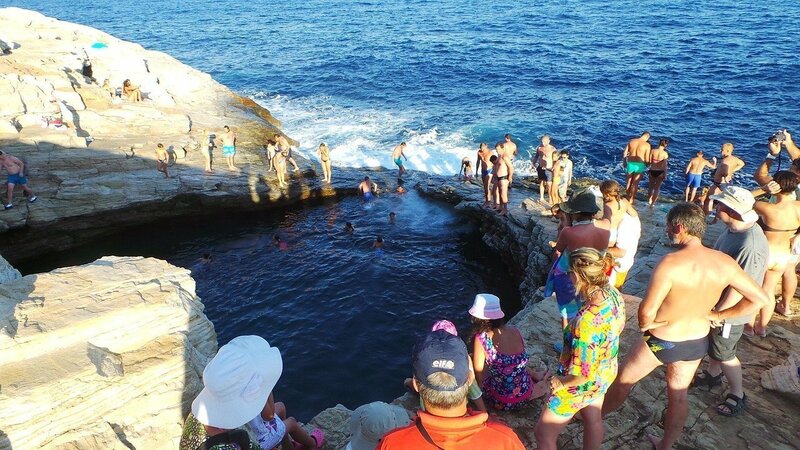 During rainy periods, the rock pools are a great place for tweens and teens to ride the rapids on floating rafts. Tucked away in the verdant bushland of the Mt Mee section of D’Aguilar National Park, North of Brisbane, are a series of large rock pools. 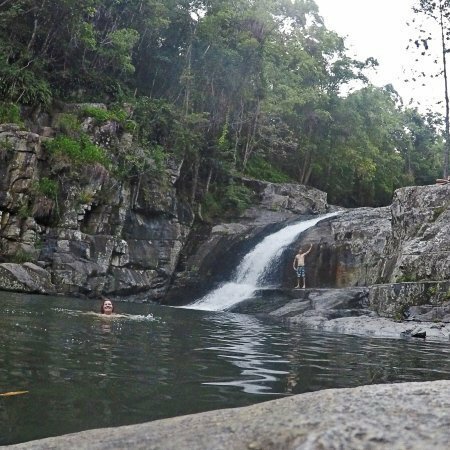 Perfect for a hot day, these swimming holes are only a 90-minute drive from the Brisbane CBD and boast a number of areas for picnics. Though diving from the rocks is forbidden, the swimming holes offer that idyllic atmosphere, far away from the heat and bustle of city life. Rocky Hole is reached through an unsealed road, which also leads to scenic lookouts: Bulls Falls and Falls Lookout, including Neurum Creek Camping Grounds. Neurum Creek is the perfect spot for parents wanting to let their children run wild across the 1700 metre frontage (though it is advised that you supervise them), as well as several areas for very young children. Located near Rocky Hole at Mt Mee, Neurum Creek rewards its visitors with a large watering hole in a serene setting, being only a 60m walk from the car park. Surrounded by thick bushland and crystal-clear water, Neurum Creek is a low-key, quiet and enjoyable location for families wishing to have a calm yet enjoyable day. If adventure is your thing, Springbrook Twin Falls will open up a whole new world of multi-level swimming holes, scenic bushwalk trails and ancient cave openings behind a powerful flow of water from the area’s cascading rock pools for you and your family to explore. With the memorable Twin Falls Circuit which is around 4km long, taking around two hours to complete, your reward will be the breath-taking scenery of the rainforest, imposing cliffs and melodic sounds of this lively national park. If nature is your thing, Springbrook Twin Falls will not disappoint, just make sure not to forget the camera and your water bottle. Within the suburb of The Gap lies the beautiful Enoggera Reservoir, previously known as Enoggera Dam. Being just a mere 20-minute drive from the Brisbane CBD, Enoggera Reservoir is one of Walkabout Creek’s main attractions, with the reservoir itself attracting hundreds of visitors weekly for a dip in the expansive reservoir. This is the perfect location for big picnics, your favourite inflatable toys and good friends for one big day out. Besides the reservoir itself, visitors can make a visit to the Wildlife Centre to get up close and personal with Australia’s wildlife or pay a visit to the Green Tree Frog Café for a bite to eat. At the end of the day, take a walk through the Araucaria Track, a mostly shaded 5km circuit suitable for all ages. A short stroll from the Tamborine National Park car park will reward you with the cascading rock pools of Cedar Creek Falls. Just be careful to not confuse them with Cedar Creek Falls in Proserpine (unless you want to drive for 13 hours straight). With a number of breath-taking waterfalls and waterholes all over the mountain, any time of the year is the perfect time to visit with all waterfalls flowing all-year round. As the Cedar Creek Rock Pools are not connected to town water, these are the only swimming holes on the mountain, but that does not take away from how stunning they are. Surrounded by huge peaks within an open canyon, Cedar Creek Falls is the perfect spot for anyone looking to take a picture of some majestic waterfalls while forgetting one’s trouble in the clear, cool waters. Just near the outskirts of north Brisbane is Gardner Falls, a lush area filled to the brim with natural wildlife and an atmosphere of pure adventure for thrill-seeking individuals. Just over an hour north of the Brisbane CBD, this little slice of heaven is worth the trip, especially if you want to be shielded from those dreadful summer rays. With a variety of pools to choose from and an expansive bush area to explore along the Obi Obi River, you are essentially guaranteed a good time. So if you ever get to visit these majestic freshwater rock pools, be sure to make a splash and swing in on a rope. As the farthest location from the Brisbane CBD, Booloumba Falls is probably more suited for those who want to go on a camping trip (tents only). However, if you are willing to make the two-hour trip northwest of Brisbane, you will be greeted with diverse forests, unique wildlife, three camping areas and over 120 species of birds to enjoy when you are not taking a dip in the crystal clear waters of Booloumba Creek. The camping areas are wheelchair accessible and toilets are also provided. Camping permits for all campsites must be booked in advance, though.